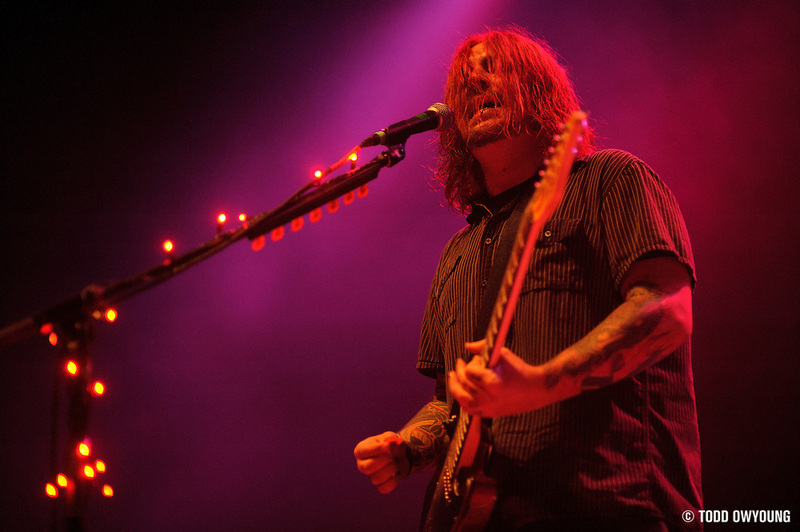 South African post-grunge rockers Seether brought a moody, dense set to the Pageant with the dim stage lighting to match. 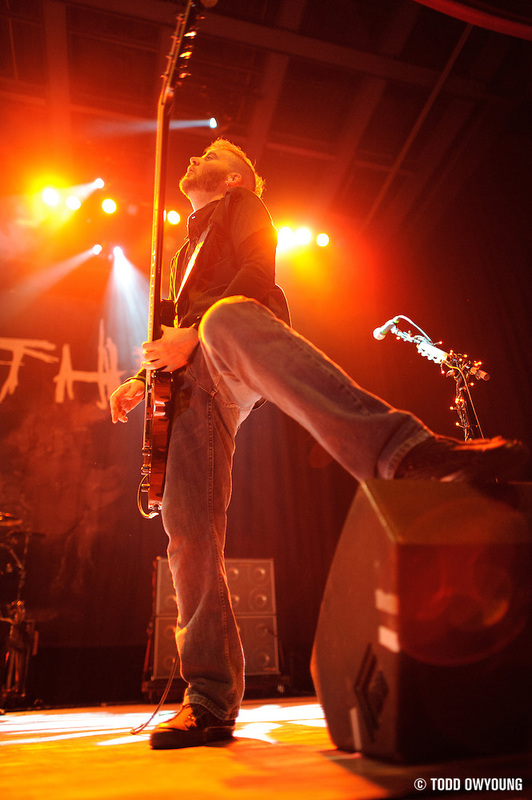 It's shows like this that I have to thank Nikon for f/1.4 primes and ISO 3200. 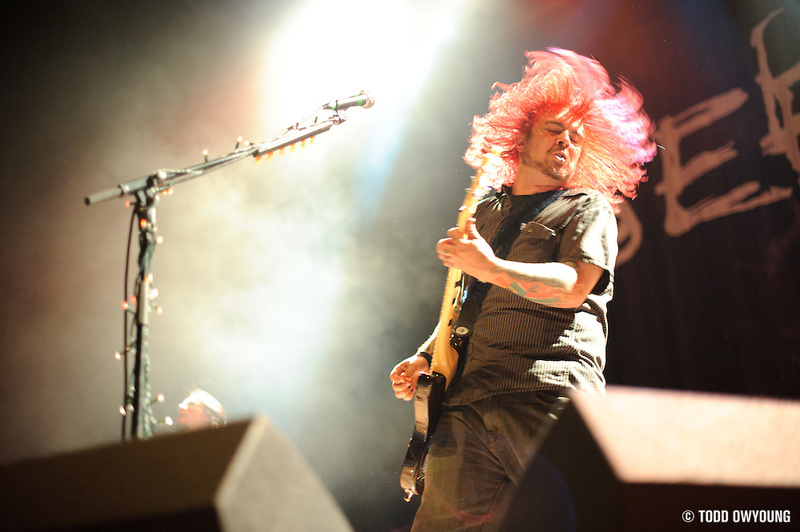 This show was very dim, but having photographed Seether in 2008, I was expecting about as much. Lots of moody backlighting for this show, with most of the light filtering in from the back as deep washes. Don't be fooled by the relative brightness of these images; that's trick of exposure. 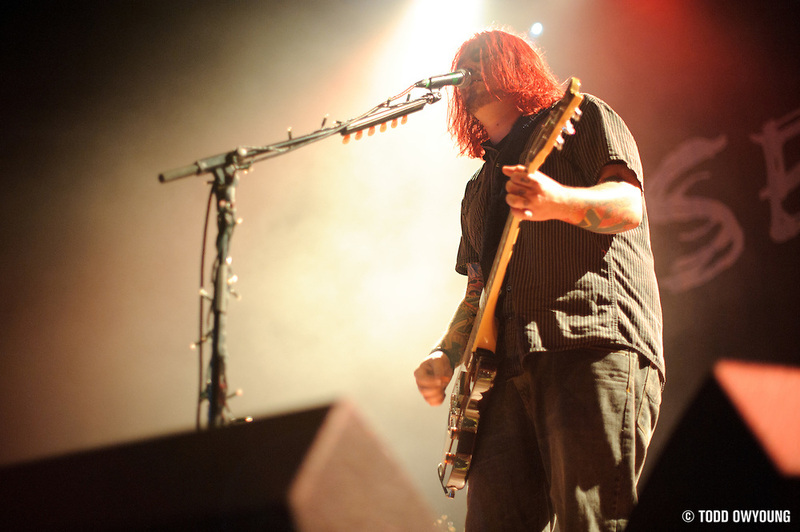 I used exclusively primes for shooting Seether, and relied on trio of nice f/1.4 Nikkors. The new 24mm, 50mm, and 85mm lenses. Together, I thought that these lenses did a great job as a kit of primes. 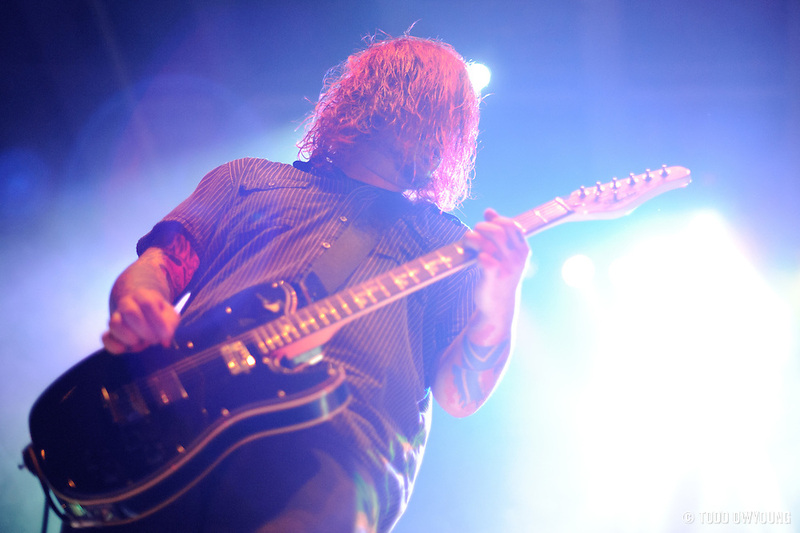 While I was interested in how a 35mm prime might have worked out, I think that the wide angle of the Nikon 24mm f/1.4 was a great option to have, even with the monitors piled around singer Shaun Morgan. My most used lens was the Nikon 50mm f/1.4, which provided a really nice field of view on the Nikon D700 for a show like this. While I never truly liked 50mm on a DX/APS frame, on a full-frame camera like the D3 or D700, I think it shines. The 85mm f/1.4 was nice for a few tighter shots of Morgan, especially since the vertical frame perfectly captured Morgan's guitar on up. Thanks for the comment. The D700 and 50mm f/1.4 does make a great combo. Relatively small, light, but capable of taking on the darkness. Hey Todd, even in those conditions u brought home amazing photos! was it like shooting in the dark? i noticed that you went high in iso too! It was pretty dark. These photos are very inaccurate when it comes to showing how bright the lighting was – but that’s the beautiful of some artistic freedom we have. I was shooting at about ISO 3200 for the shoot – I went down to ISO 2500 for a few shots, but it was dark enough to warrant shooting at ISO 3200 at 1/100 and f/1.4 quite a bit. What ISO do you normally aim for with these types of shows? I’ve only shot a handful of ‘big club’/’arena’ shows – mostly dark bar shows where the primes are a requirement – and I’ve found that it’s nice to have the freedom to go down to 800 every once in awhile. Just my feelings on the 50! I never really got used to it on DX, but on FX, it feels like the classic focal length it always was! For a (relatively) light set-up, the D700+50/1.4D is a great way to go! You know, you might want to check out the new 50mm f/1.4 AF-S. It doesn’t focus any faster, but it does have an improved (that is, more modern) character and contrast. Similar sharpness, but the improved contrast adds to the overall impression of acuity. Still, I wish that Nikon had dropped in Nano Crystal Coating on the new 50mm. It seems to do wonders for everything else it touches. Yeah, the 24mm does have some interesting flare. It actually reminds me of some weird flare I’ve seen from Leica lenses. For these shows, ISO 3200 is probably my choice if I’m shooting primes. The image quality is still pretty good, but of course more sensitivity than ISO 1600. 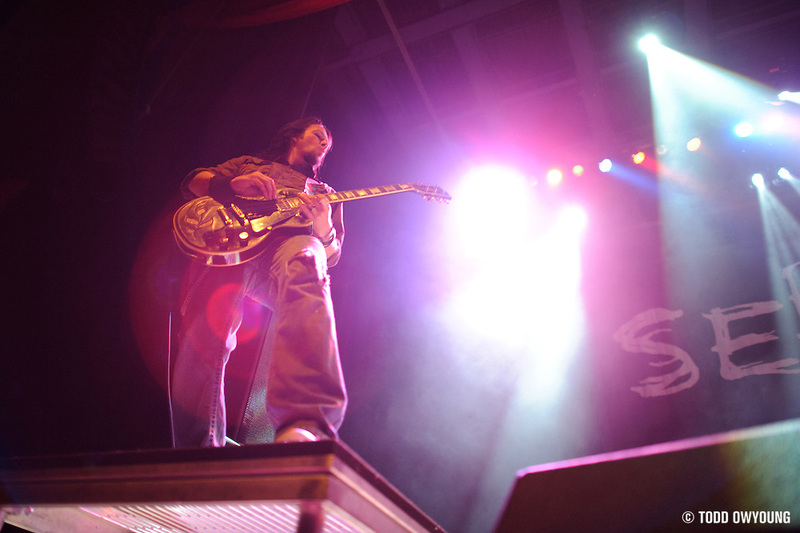 ISO 3200 w/ an aperture of f/1.4 and a marginal shutter speed is enough to open up most any kind of darkness at the shows I photograph. I was wondering about printing when you pump up the iso to 3200. I’m so hesistant now in case I ever want to print. What are your thoughts? It must have been super dark if you went that high on a 1.4!! I do a lot of small, dark shows that a 1.4 is a must (I use 50 1.4) I can’t wait to get the 24 so I can get more of the stage!. Thx! When you’re packing only primes, do you typically just bring the ones you mentioned above, or does it depend on the event? It depends on the event, thought the trio of the 24mm, 50mm, and 85mm f/1.4 primes are all excellent performers. If I were building a kit of primes, they’d have to be at the top of the list. Add in the new 35mm f/1.4 and the 105/2 or 135/2 DC lenses, you’re pretty well set. Nice shots. 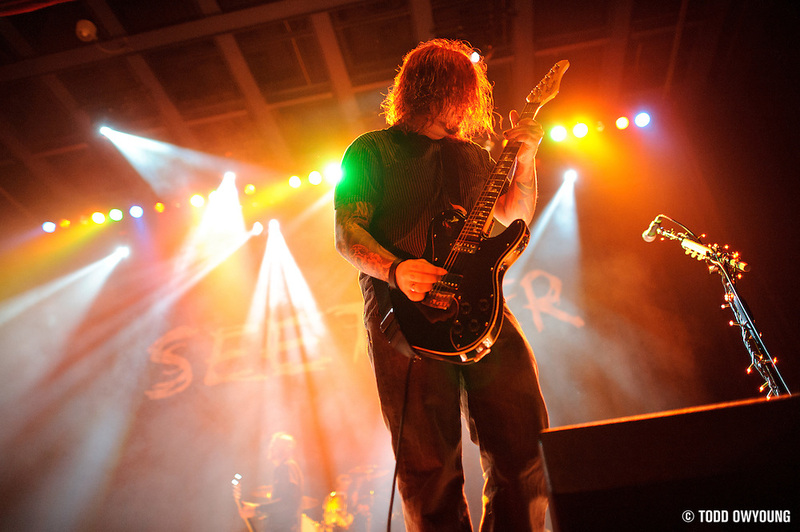 I get to shoot Seether on 9/15. Nice to know I have to work my ninja powers to get some workable shots. Hey Michael, thanks for the comment. 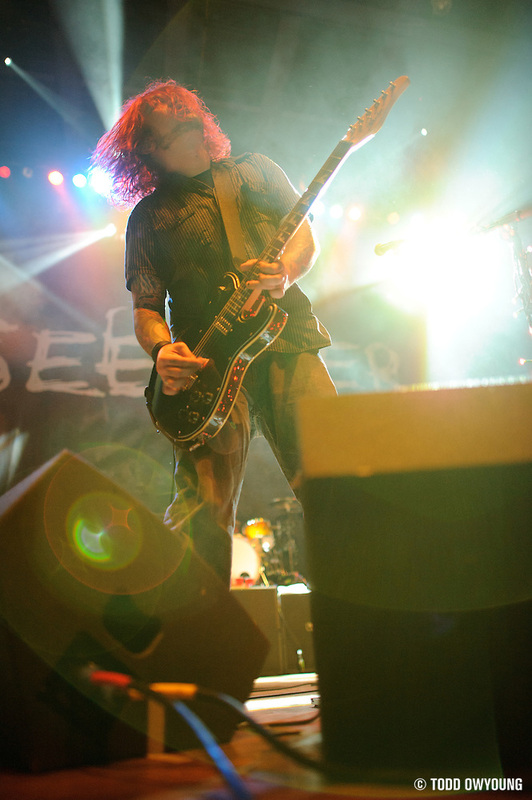 Good luck with your Seether show – bring some fast lenses, and have fun.